In the 25 years I’ve lived in Denver, I had never been to Snowmass Village before I traveled there this past weekend. There is no way now to make up for that though I wish I could! It was an unexpected highlight of those 25 years, beginning from the very moment that you turn a bend and see the entire valley spread out before you; a wide open swath of space and beauty like nothing I have ever experienced before. A view only to be outdone by traversing the mountain on two sets of gondolas and a chairlift to the very top where we were greeted with the view above. A serious mouth gaping, sounds of amazement wonder. Still now, I get a chill remembering that moment. 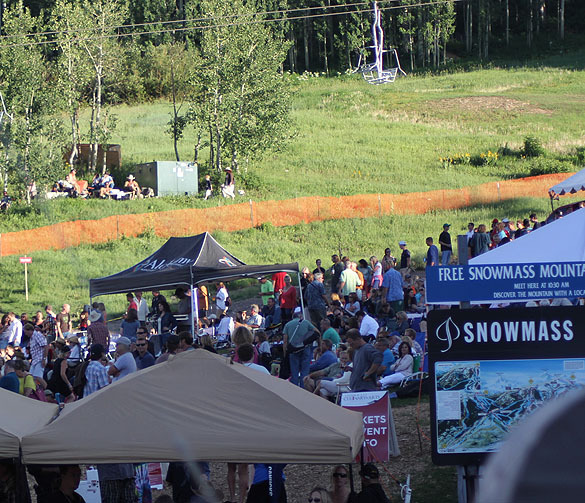 I’ve mentioned that I was invited to cover the Snowmass Culinary and Arts Festival; only in it’s second year. As I started on my journey to Snowmass, I also wanted to share with you what I see almost every day…and what I too often forget to be amazed by. That is Mount Evans through my telephoto lens at an intersection near my neighborhood; a building in the Denver Tech Center visible in the foreground. Nine AM in the morning. Four hours later I would be past that mountain peak and experiencing vistas that are far too beautiful to be captured with my camera. It’s no secret I love Colorado and it’s majestic beauty is definitely part of the reason why. 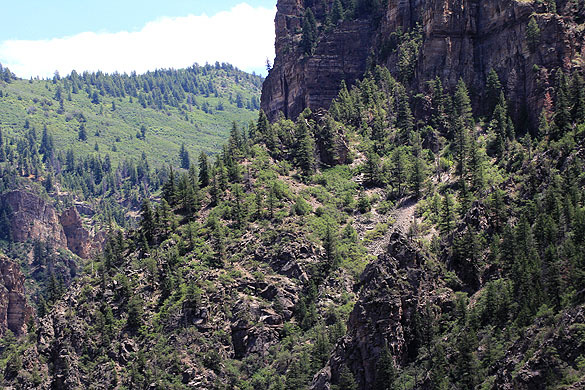 A bit more than halfway from Greenwood Village to Snowmass Village along I-70 takes you through Glenwood Canyon where you are surrounded by walls of rock combined with vistas of blue sky dotted with green spruce trees. I was lucky to notice ahead of me on the highway an area for construction vehicles so I pulled over to take this photo…I promise I did not take this while driving a mountain highway at 75 mph! 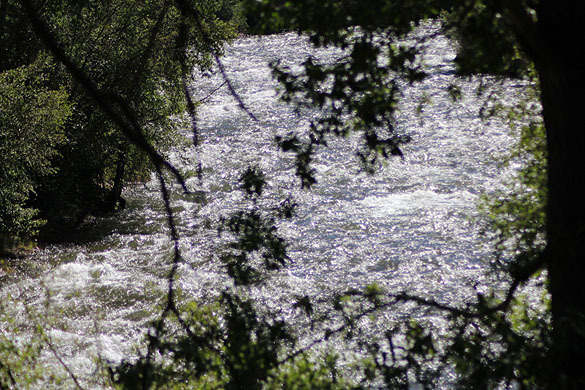 This picture of the White River is on the highway between Glenwood Springs and Snowmass, in the White River National Forest. An amazing sight, that swiftly moving and churning water…accentuated certainly by the knowledge of how dangerous it can be. I did see people in rafts a bit further up he road; I’ve been on a rafting trip, albeit many years ago, it’s really an amazing thrill. Most resorts in the area can hook you up with a company that provides all you need for this adventure. Once I arrived in Snowmass and had checked into the Viceroy Resort; beyond luxuriating in the surroundings, we had our first meal of the day at The Nest restaurant in the hotel. Basically a chicken wrap, it was perfect as I had not eaten that morning but had no idea what to expect from the evening! Filled with a modest amount of chicken and a beautiful array of julienne veggies and cilantro, it was the perfect antidote to my hunger without filling me up so much that I wouldn’t feel like navigating outside a bit to check out Snowmass Village Mall where all of the weekend festivities would be centered. Later, we joined our host, Patsy Popejoy of Snowmass Tourism Group and our PR pal Jim with Guttau PR on the deck of Richard Sandoval’s Venga Venga Restaurant situated on prime real estate in the mall where we enjoyed mountain vistas and music from the regularly scheduled Thursday night concert. With the smell of barbecue lingering in the air from vendors at the edge of the crowd, our table enjoyed fabulous Mexican food and margaritas. Life is good. My schedule over the next couple of days included attending several cooking demonstrations, meeting with and interviewing a number of the celebrity chef’s and of course enjoying the food offered at both the demonstrations and the events planned for members of the media. Knowing my readers were excited about my meeting Hosea Rosenberg, Bravo’s Top Chef in 2009, I decided to share that experience from Saturday first. 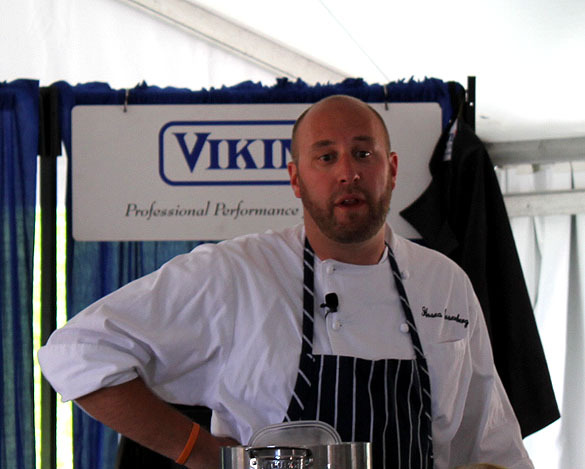 Chef Rosenberg, originally from Taos, New Mexico, attended the University of Colorado in Boulder and received his Bachelors of Science in Engineering Physics; he must have misread that brochure because his passion has always been good food with quality ingredients and great flavor as paramount to his goal. His journey that has seen his career take off in the past couple of years started after graduation and he has served in positions cooking for Wolfgang Puck, Kevin Taylor and Sean Yontz. 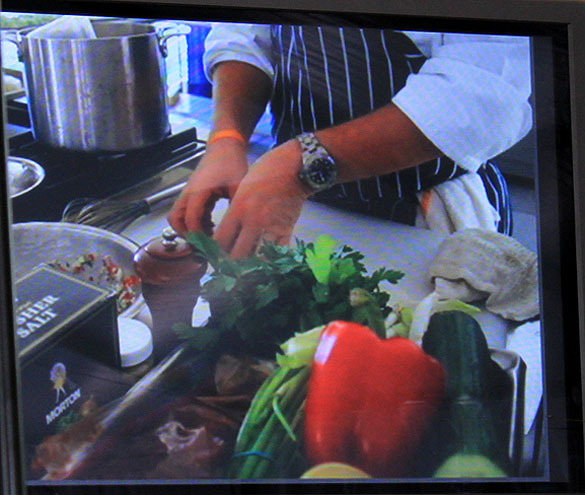 Loved the monitors in the tent that allowed us to see all of the chefs in action…very nice touch! When Chef Hosea mentioned to an audience member that he made his own bacon using pork belly…well, seriously? Me too! Really…a couple of months ago I would not have been able to say that but now you must all know I’m totally nuts over Maple Bourbon Bacon! Hosea is a self taught chef; working in and around the world of food for many years and his experience of growing up in New Mexico is evident in the foods he enjoys preparing. 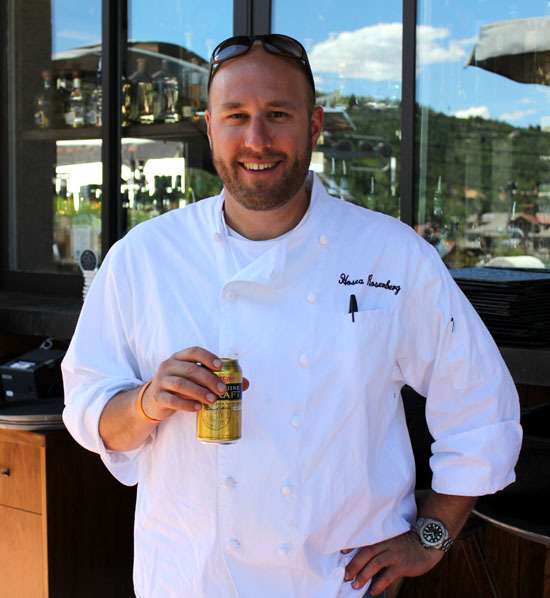 Most recently the Executive Chef of Jax Fish House in Boulder, Chef Hosea’s fame on a larger scale is most certainly attributed to being acclaimed as Bravo TV’s ‘Top Chef’ in 2009. 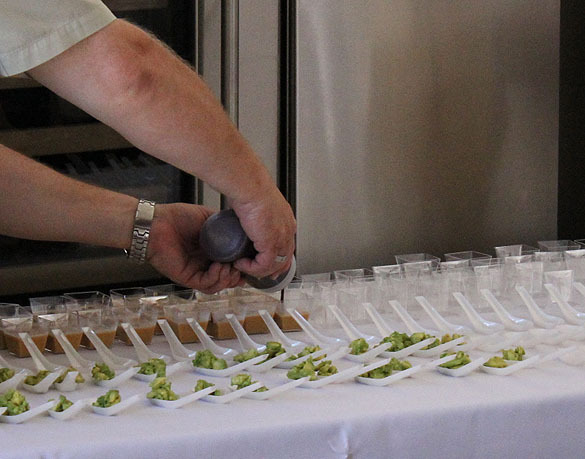 While working on the Smoked Corn Soup with Smoked Pork Belly and Avocado that we would sample, he answered questions from the audience. I don’t know if we were all skirting the one topic that we all wanted to know about…but it was fun to see him respond so positively when one audience member finally mentioned those two words. Top Chef. While admitting it was a once in a lifetime experience (good and bad) and acknowledging that it has given him a lot of opportunity as the result of the show (and I would imagine especially as the season winner), there were definitely minuses. Can you really imagine 6 weeks without the following: Phone, Internet, laptop, iPod, TV, Radio, or TWITTER? Gone…any and all forms of communication. Living with the same folks and working with them day in and day out? Being prompted to diss your ‘friendly’ competitors in interviews (yes, it’s true!) and even being caught…through the most determined of all camera shots, canoodling with another contestant? While we see the contestants getting into those bright pretty new cars for the drive away and drive up to event shots…the truth is that once those shots are complete, they get out and are all piled into more of a utility van for actual travel. Sneaky little buggars! The one thing that my friends and tweeps wanted to know for reals? Did she or didn’t she? Breakup with him that is. He was ever the gentleman but the truth is, hmm…let’s just say that he and his girlfriend did not stay together but that he is friends with all parties today. Which is good news for my friend Chris at MeleCotte who most definitely has a celebrity crush (I’m quite certain she is not alone!). I think the one tidbit of information I hadn’t considered that made the biggest impact on me was that the people leaving the show don’t really go home! Makes sense…if they did, word would get out who was ‘kicked off.’ Nope…they all go to a ‘losers’ house where the have to stay for the entire run of the filming. Ouch…that sounds miserable on so many levels! You know what I wanted more than anything from the interview I had with Hosea after his demonstration? I wanted to like him as much as I did when I watched the show. I mean, contrary to the folks who try to pit Boulder against Denver in every which way possible, I just wanted the Colorado boy to win. And even more so because he seemed so likeable. And you know what? He was and I did. There was no stuffy pretentiousness or attitude that he had no time for us. He was a nice guy with a story to tell that we were all a part of in a small way…and it was nice catching up. A wonderful smokey combination of corn, bacon and chiles. Smoke corn in a hot smoker (or stovetop smoker) at 200 for about one hour. Cut kernels off of cobs as closely to the core as possible. Break cobs in half, put in medium sized pot, and cover with cold water. Bring to boil and simmer for two hours. Strain “corn stock” and discard cobs. In medium sized, heavy bottomed stockpot, cook bacon over low heat until crispy. Add onion and cook until soft and translucent. Add garlic and cook for another five minutes. Add spices and turn heat to medium-high. Toast spices for about one minute and add smoked corn. Stir over heat for another two minutes. Add corn stock and simmer for 30 minutes. Add cream and simmer another 15 minutes. Transfer to blender and puree until very smooth (strain if desired). Season with salt, pepper and lime juice as needed. Cover ancho chiles with hot water for about 20 minutes, or until very soft. Place chiles and honey in blender and puree until smooth – adding soaking water a little at a time as needed. Place a large ladle of soup in bowl. Top with sliced avocado, diced heated pork belly, and a drizzle of ancho honey. Yes, I got to sample this. Yes, I loved it. Yes, I will be making it soon! Follow Hosea on Twitter too! @ChefHosea and stay tuned…up later this week will be an article about Chef Richard Sandoval, the most successful yet unknown Latin chef in the country and his firecracker partner in crime (well, with an upcoming book at least), Personal Chef and Nutritionist Diane Henderiks. Stunning scenic photographs! What a wonderful place to hold a festival and what a beautiful write-up you did on it and one Chef Hosea (super photo btw) complete with fantastic food shots. Well done Barb and thanks so much for sharing the scenery, the day and the people with us. Could only have been better with some of my favorite tweeps there too…next year maybe? Please… bacon? Avocado? Corn? Cream? Lime? Chilies? All my favourites in one recipe? Bless you, my child. Except I don’t have a smoker. I’m not sure I care. 🙂 It’s corn season here, plus I keep bees and have my own honey, so this recipe is making me very happy. I’ll put it in the “to make” pile and keep you posted! First, let me say I’ve never visited that area so I’m living vicariously through you and your gorgeous pics. Second, it sounds like the festival had the perfect combination of events. In other words, it sounds like the perfect festival for me to put on my to-do list for next year. Yes, yes, yes!! I’ll be talking to them about a food blogger package we hope to put together. A group event within their already amazing event. Already excited but guess I have to wait a year! Barb, you lucky duck! What an amazing experience. My gosh, how gorgeous is your part of the world? Hosea is one of my favorite TC’ers so far. He seems like such a nice person! He was pretty adorable Elle. Same for me and was so glad he did not burst that bubble. You should come this way. Bring lobster. What a great post! 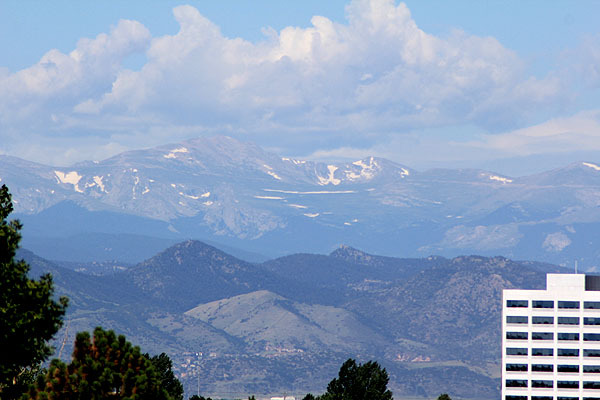 I love and miss Colorado (I went to Boulder for college for a while). Awesome photos and that recipe looks fabulous! Thanks Alison; it was the most memorable experience. I hope to make the soup soon myself. Not just to eat…but I want a mouthwatering photo to share too! I never knew that about Top Chef! Crazy that they don’t get to go home. I guess that makes sense. I know…we should have figured that out, right? He is pretty adorable; charmed everyone, including me. Lucky you Barbara. Wonderful experience, and what beautiful scenic views. Nature never ceases to amaze. Thank you for making my morning so breathtaking! You are most welcome…it was breathtaking. I want to make that drive as a passenger and really enjoy the views one day myself! It was all of that and then some Rebecca. The perfect weekend. Sounds like you had a wonderful time. Beautiful photos and interesting write up. So glad to see that you now have a bacon soul brother. Speaking of that, it seems like I have some pork belly in your freezer. We’ll have to get to that sometime soon. Yes it is…and yes we do! Very soon. Now craving some bad. Thank you so much for taking such great care of my pup; I’m sure she’s missing you now! oooh! The views! Makes me ache to get back out there. Stunning for sure. I wish I knew about the Festival. It’s the type of thing I would have traveled for, for sure. Next year! And, what news about Chef! Sad, but maybe if he comes to Atlanta….heee. Thanks for thinking of me! So beautiful I can’t wait to get back. I would move there but my home in Denver would probably only sell for enough to buy me a room in Snowmass! 🙂 Next year my dear. Quite a wonderful weekend Barb, so many stimulations for the senses. Thanks for bringing it to us and the interview with chef hosea he is really a sweetheart! More to come…but you are right on; a sweetheart he was for sure. fun was had by all! If ever I am in your neck of the woods I am coming over for soup! A great event in a wonderful place. That soup sounds and looks really mouthwatering! I just had a taste…and it was exactly that. I can’t wait to make my own batch now.